This is a game about a disgruntled child. A Founder. The game only has one level, and the objective is to reach the exit (the yellow cylinder). Along the way, you must avoid the Tomb as they kill you, and collect the Ship. I use some sound effects from FreeSound, like the sound of Ship. Using Google and a tool called Metaphor Magnet, I discovered that people feel charmed by Founder sometimes. So I chose a unnerving piece of music from Kevin Macleod's Incompetech website to complement the game's mood. Let me know what you think. In future I'll put more levels into my games, and also make the mechanics more interesting. 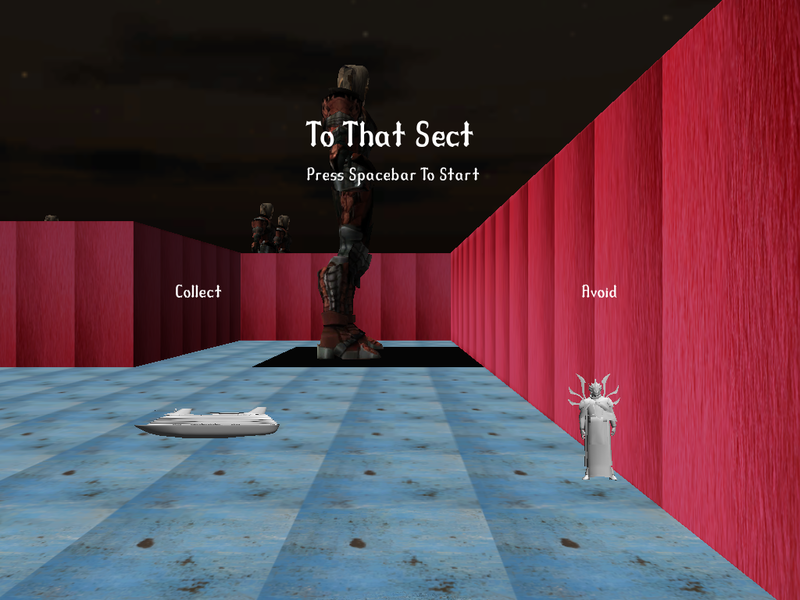 To That Sect is a game designed by ANGELINA, an artificially intelligent piece of software designed by me, Michael Cook, an AI and Computational Creativity researcher. To That Sect was ANGELINA's entry into Ludum Dare 28 - "You Only Get One". You can read the paper I wrote about the process here, and you can still see the Ludum Dare page, with rankings and comments, here. We also ran a second control entry, Stretch Bouquet Point, which you can play on itch here.